Samsung has launched its Unbox Magic smart television in India, with which the company wishes to redefine the Smart TV market in the country. The new TV series from Samsung comes with smart features like Personal Computer, Music System, Home Cloud, Live Cast and Two Way Sharing. Samsung has said that with the launch of the new TVs, it wishes to innovate the ‘Make in India’ campaign as the Unbox Magic smart television series has been designed keeping the Indian consumers in mind. The picture definition in the newly launched Unbox Magic smart TV series comes with picture quality ranging from High Definition range with Ultra Pix technology to the Ultra High Definition (UHD) 4K models with superior colours, details and contrast. The base model of the Samsung Smart TV that comes with 32-inch screen size costs Rs 24,900. The display sizes go up to 82-inch and all of them are priced differently. The newly launched Smart TVs are available at all Samsung Smart Plazas and leading consumer electronic stores. Although the screen sizes of the newly launched Samsung Unbox Magic Smart TV series may vary, other internals of the televisions is largely the same. 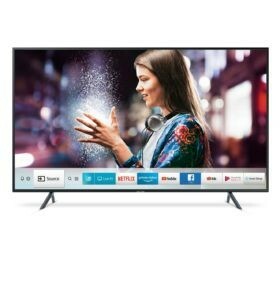 As mentioned earliere, the new Smart TVs series comes with various features such as Personal Computer, Music System, Home Cloud, Live Cast and Two-Way Sharing. The Personal Computer feature allows the user to transform the TV into a PC screen. The users can not only browse the internet, but also create documents or create presentations on the cloud. The PC feature of the Smart TV also allows the users to mirror their laptop on the Smart TV screen wirelessly and without using the internet. The users can also remotely access their laptop or PC and they can also use the Microsoft Office 365 services over cloud. The Music System of Samsung’s Smart TVs turns the TV into a virtual music system by adding visual elements on the screen. It allows the user to choose from a library of skins with different colour options. The Home Cloud feature of the Samsung Unbox Magic Smart TV series allows the TV to become a virtual cloud for automatically storing the user’s necessary files. Once connected with a smartphone the pictures and videos are automatically transferred wirelessly without an internet connection on to the USB device connected to the TV. This feature allows the user to transfer files from the smartphone to the TV and view them on a larger screen while also freeing up the memory of the smartphone. 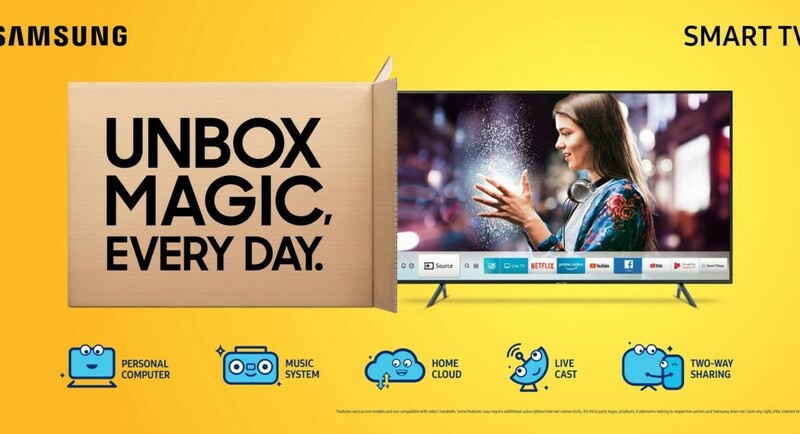 There is also the Live Cast option on the Samsung Unbox Magic Smart TV series which allows the users to stream live from any location on to their Smart TV through the internet by using their smartphones. Other features of the Samsung Unbox Magic Smart TV series are the Two Way Sharing which allows the sharing of content between the TV and smartphone and vice-versa. While the Samsung Smart Hub gives the users single access to live TV, apps and other sources.